This video was made parallel to the Mended Spiderweb series in Finland, summer 1998. Among a collection of old books in the house on the island, I found Kom Bara Lite Närmare ("Just Come a Little Closer"), an illustrated Swedish nature book from the 1950s. In a chapter on spiders it described the spider's sometime habit of using its thread as wrapping paper to package its dead prey and present it to another spider. 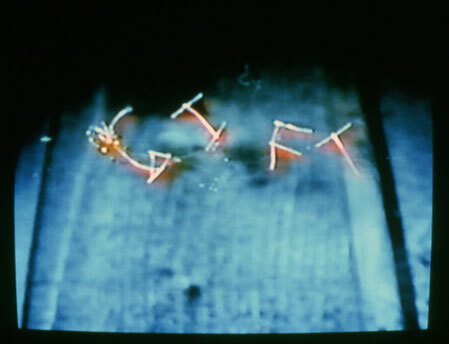 From this came the idea for the 10-minute video "GIFT/GIFT" (the word, pronounced in Swedish, means "poison"). Small letters made of thread spell out the word one letter at a time in the spiderweb. A particularly aggressive spider battles a pair of persistent tweezers for control of the web. The tweezers manage, with great difficulty and damage to the web, to insert the letters. The spider returns, picks out the letters in order, and makes a few repairs before settling back into the web where it was to begin with.